The Christmas tree that stands so beautiful and tall, adorned with ornaments as old as I am...belonged to my beautiful mom. 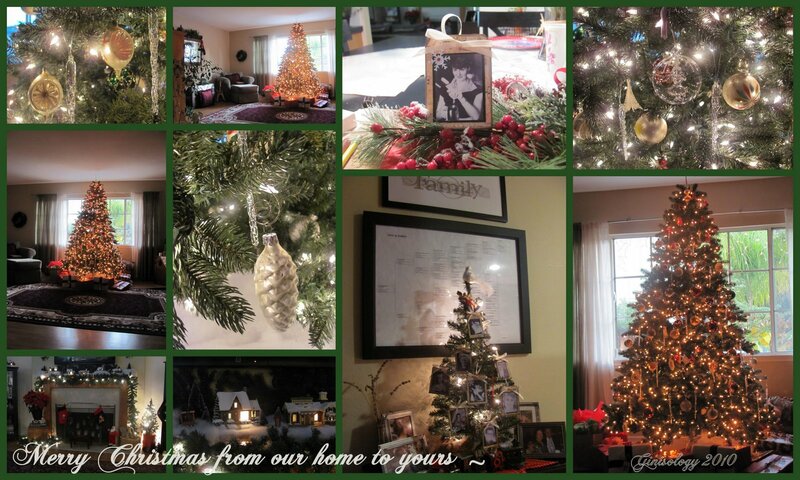 I recently inherited her family room tree (artificial ) and ornaments. At first, it was difficult but as I continued to decorate for the holidays...I felt surrounded by her and all Christmas things she loved so much. I have to say, it feels good, and I think now the hard part will be having to take it all down. I also inherited only part of her Thomas Kincade Christmas Village collection...there are many more pieces to the collection I hope to own someday. It's a beautiful village and each time I look at it...I smile and mom warms my heart and I know she is here with our family. So VERY BEAUTIFUL Gini! Merry Christmas to you and your family! May love abound! Gini, your card is just beautiful, the prettiest I've seen. I could look at your mom's tree for ever, and I'm sure she is glad you posted this. I hope you and your family have a wonderful Christmas (at this difficult time). Merry Christmas Gini, like Barbara says, the prettiest card I have seen. Your mother's tree is fantastic, enjoy it, may it fill your heart with warm and wonderful memories. Cheryl, Barbara and Carol ~ thank you so much for enjoying my mom's Christmas tree, ornaments and village with me...mom has surrounded us with her love and warmth.